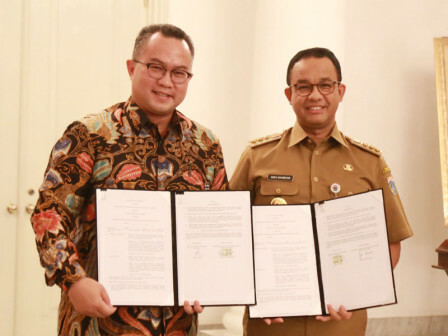 " I hope we can do concrete activities for a better city"
It was officially signed by Jakarta Governor, Anies Baswedan and IPB Rector, Arif Satria at Jakarta City Hall, Jalan Medan Merdeka Selatan, Gambir, Central Jakarta. The first thing is about education, it will include sending employees to continue their study for graduate (S2) and doctoral (S3) degree programs, undergraduate (S1) for Jakartans who study in IPB, agriculture product training, high-school education development and vocation. The second is about research such as, supply chain mapping study and food distribution network, food balance, community consumption pattern, food alert system, food subsidies analysis, blockchain for meat products, entrepreneurship and small-medium enterprises (UKM) training, urban farming, green mussels issue in Jakarta, hydrology and water management and waste management, as well as food inflation study. And the last is community service such as, student nutrition program, sea farming field laboratory in Seribu Islands, qurban animal examination, Ragunan Zoo management, clinic plant city, animal healthcare, free medical check-up consultation, children and family, as well as landscape management. Anies hoped that it could create a breakthrough, especially related to realizing food security. "I hope we can do concrete activities for a better city," he expressed, Monday (1/21). IPB Rector, Arif Satria expressed that various cooperation will be realized in agricultural and food sectors such as, research on superior seeds for Jakartans to the application of the sea farming concept. "Sea farming will be developed in Jakarta as new breakthrough in preserving the environment of Jakarta," he uttered. He also intends to collaborate with the city government to produce experts in agriculture. "We want Jakartans to have more opportunities to study at IPB and develop themselves in facing challenges in the world of agriculture," he stressed.